As any voracious reader knows, there are so many books out there, it can be hard to choose just what to read next. So what could be better than a hand-picked recommendation from someone in the know? 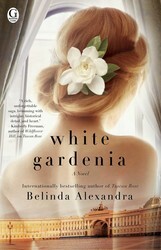 Every Wednesday the XOXOAD team likes to find out what some of its favorite authors are reading; today we’ve asked Belinda Alexandra, author of the gorgeous White Gardenia to tell us! Writing novels with historical settings means that I am always reading. In fact, I often joke that the amount of research reading I do for each book is equivalent to a University degree, therefore I’m becoming smarter with each novel! I read everything from historical tomes about the period, to the newspapers of the day, to the popular novels of the time. Today I am deep into Terry Teachout’s biography of Duke Ellington, Duke: The Life of Duke Ellington and am fascinated to learn that the jazz legend hated to finish anything, much to the frustration of those around him! However, when it’s time to switch off at the end of the day and do some personal reading, that precious hour before sleeping when I curl up in bed with my cats, hubby and a cup of lavender and rose tea, I love to read beautiful and inspiring stories to relax and drift off into sweet dreams. The book that I am absolutely devouring at the moment is: Piano Lessons: Music, Love and Time Adventures by Noah Adams. Music and dance find their way into all my novels, White Gardenia being no exception, because I’m passionate about them. I came across Piano Lessons when I was looking for something else, and was immediately drawn to it. I love everything about pianos: the music; the composers; the way the instruments are constructed. Whenever I see a piano I feel drawn to it. I returned from a recent research trip to New Orleans with pictures of pianos in antique shops, hotels, bars and historic plantation homes. I truly have a piano fetish! Beautiful prose: THE MORNING – SUNRISE, eleven degrees, wind dancing across the overnight snow – waits for the perfectly struck single note. Inspiring stories: My favorite one is about journalist John Hockenberry, who was left a paraplegic and living on food stamps after a car accident, but managed to master the piano to the degree that he was accepted into the University of Oregon’s School of Music. He went on to invent a device that would allow him to use the pedals of the piano. I loved the story and considering that many of us with far less difficulties to overcome often get felled by small challenges, it was very inspirational. Piano Lessons is a beautiful book about a middle-aged career man who makes time in his busy, responsibility riddled life for his passion and his dream, and how doing so changes him and brings him alive. It’s a lovely story, especially for those who adore music. Highly recommended!